Officially, it was lunchtime. We had just gotten back from the Berkeley Bowl, and while I unloaded bag after bag of produce, I set aside a few things that really appealed to me. I’d already nibbled on the thuringer salami with the kids in the checkout line, and I’d helped them polish off some sushi in the car on the way home, so I wasn’t wanting to make a whole meal for myself. Just a really fun, tasty side salad to fill me up with vegetable goodness. The cantaloupe-looking melon with an unusual name was my star, and the kids were happy to help me sample it. Really fresh greens, mint, a shallot, and a gorgeous lime, and I was ready to start chopping. 3 cups arugula and mixed asian greens. 1/8 hami melon, sliced into bite sized pieces (substitute with cantaloupe). I filled a glass bowl with the arugula and the mixed asian greens, then zested a lime over the greens. Once the zest was removed, I juiced the lime and measured a bit into a jar. 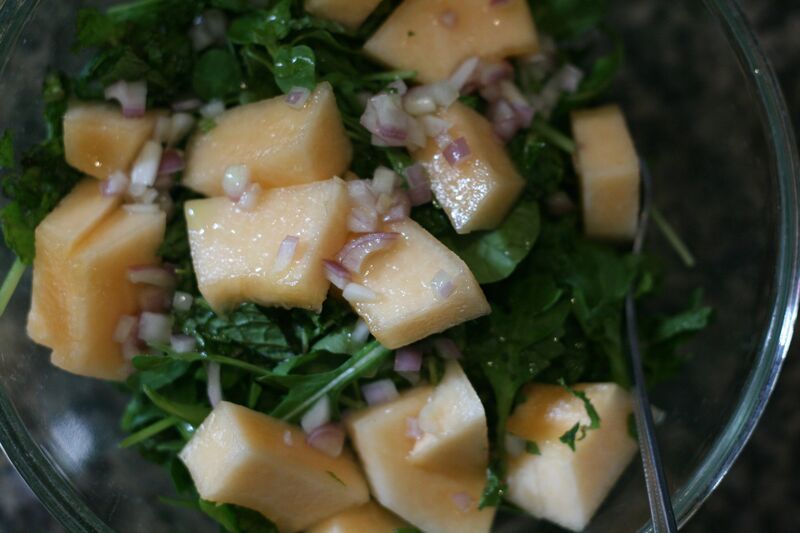 I added the diced shallot and salt to the lime juice, and let that sit while I cut up the hami melon and chopped the mint. Then I added extra virgin olive oil and a touch of maple syrup to my citronette, shook it up, drizzled it over the salad, fork tossed, and enjoyed. 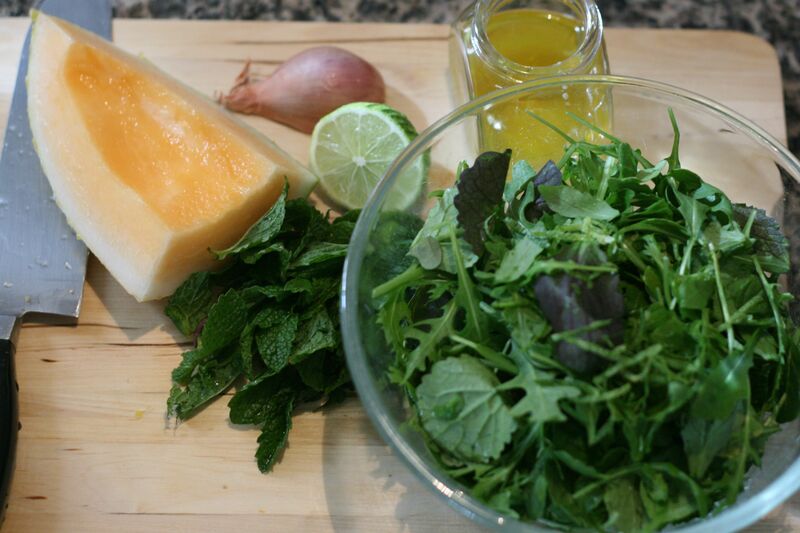 Here it is, crisp melon and tasty mint, ready to eat! This was really different. The bitter greens were perfect with the hami melon, which was incredibly light and crisp. It had a really unique texture — imagine an apple and a cantaloupe mating, and you’ll have an idea of what the hami has going for it. Perfect salad fruit. The lime and mint brought everything together, reminding me a bit of the fresh flavors of Vietnamese food. I think it would be fun to push this salad further, with some chili flakes, and to serve it with Pho. I liked how clean the flavors were, so I’d recommend keeping it a side salad, but if you really want to toss some protein in, I can see grilled chicken or steak working pretty well. Quinoa or shelled edamame might also work, if you need a veggie version. I think the hami is crisp enough to go in with the lettuce, though if it’ll be sitting in the fridge for a long time, the citronette jar might be a better place for it. As always, dressing gets its own little jar, salad ingredients go in a large glass or stainless steel container, and combine it all when you’re ready to eat. Toss it with your fork to help mix the dressing in, or do what my husband does and put the lid back on the salad container and give it a few good shakes.